OTTAWA, Ontario (AP) — On a night Chicago’s Patrick Kane hit a milestone, Mike Hoffman was the difference-maker for Ottawa. 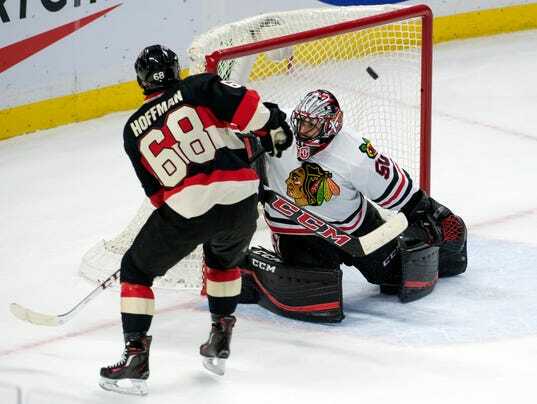 Hoffman scored his second goal of the game 30 seconds into overtime as the Senators beat the Blackhawks 4-3 Thursday night. The winner came as a relief for Hoffman, who had hit the post in the dying seconds of regulation with the game tied. “I think I had (Corey) Crawford beat, but didn’t manage to find the back, and then in overtime there’s always going to be chances so if that one didn’t go in they were probably going to go down to the same thing, 2-on-1. That’s kind of how 3-on-3 works,” said Hoffman. Hoffman now has an eight-game point streak (8 goals, 3 assists). While impressive, it pales in comparison to Kane’s 21-game point streak. With a first-period goal, Kane — who also had two assists — tied Bobby Hull’s franchise-best scoring streak set in 1971-72.